When I make guacamole, I always make a ton. I want to expend the energy once and milk the benefits of my labor for a few days. I’m kind of lazy that way. And when I have leftover guacamole (remember to store it properly), I always make one or more of three dishes. I’ve already posted two of the dishes: the sweet potato and black bean tacos and the TLT (tempeh, lettuce, and tomato sandwich). And the last of the troika is the kimchi fried rice and creamy black bean burritos. Don’t let the list of ingredients scare you off. This is a super easy recipe. 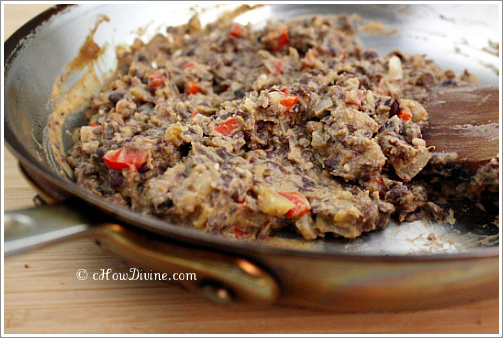 And like the sweet potato and black bean taco, it doesn’t take much to make them taste good. Just a dollop of guacamole or sour cream, for non-vegans, will do. Make a big batch of the beans and enjoy it over a few days. That’s how I survive the week. Thank goodness for yummy leftovers. Without them, I would be doing a lot more takeout. Rinse and drain the beans. Mash the beans using a fork until smooth. Heat a pan on medium heat. Add just enough oil to coat the bottom of the pan. Add minced garlic and chopped onions to the pan. Sauté until the onions are almost translucent. Add chopped bell peppers to the pan and sauté until the onions are translucent and bell peppers are soft. Add a pinch of salt and stir. Add the mashed beans to the pan and 2-3 TB of water. Stir until heated through. Add tamari, dijon mustard, cumin, and cayenne. 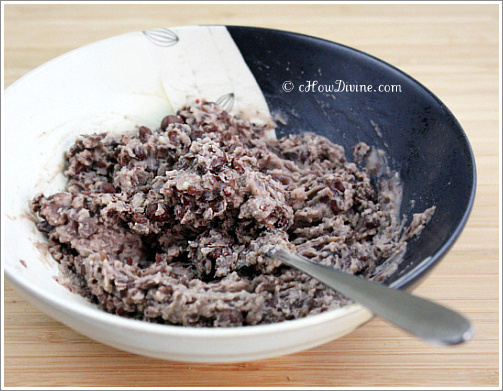 Add additional water to thin it out as necessary if the beans become too dry. The texture should be smooth and creamy. Mix well. If necessary, salt to taste. Place a nonstick pan over medium-high heat. Once heated, add a little bit (~ 2 tsp) of oil and melt a dab of butter (if using) in the oil. Swirl to coat the pan. Add drained kimchi and sauté. Sauté for a few minutes until kimchi becomes transluscent. Add gochujang. Mix well to ensure that the gochujang is well distributed. Once the gochujang is mixed in, immediately add the rice. Gochujang has a tendency to burn; so, make sure to add the rice immediately. Mix well. Once well combined, thinly spread out the contents. Let it “toast” until the rice starts to turn golden brown and slightly crispy. Mix well. 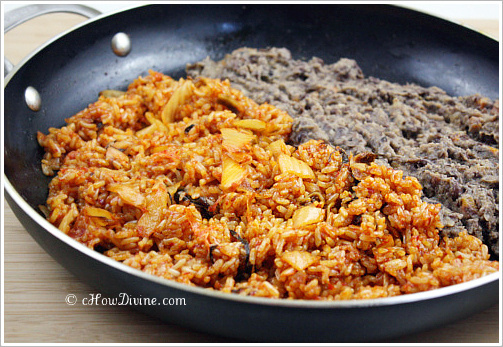 Push the kimchi fried rice to the side and add the beans to the pan. Keep them warm until you are ready to assemble the burritos by keeping the heat on the pan very low. Add water to the beans as necessary to keep them moist. Remove from heat once ready to assemble. Warm up the tortillas by heating them on a hot pan (~15 seconds on each side). Wrap them in a towel or aluminum foil to keep them warm until ready to assemble the burritos. Depending on how many burritos you are making, scoop about 1/2 or 1/3 of the rice and beans in the center of the tortillas. Add guacamole or sour cream on top (and salsa if using). Top with shredded lettuce if using. Roll up the burrito by folding in the edge nearest to you, followed by folding in the sides, and rolling the burrito away from you. Enjoy with additional guac and/or salsa! * Many brands of kimchi contain fish sauce or salted shrimp. If you are strictly vegan or vegetarian, look at the label. I get kimchi from Whole Foods sometimes. And they carry vegan kimchi. Korean-Style Sweet and Spicy Chicken "Wings"
Another recipe for my meatless month! Looks delish! Thanks Nic! Good luck on your meatless month! 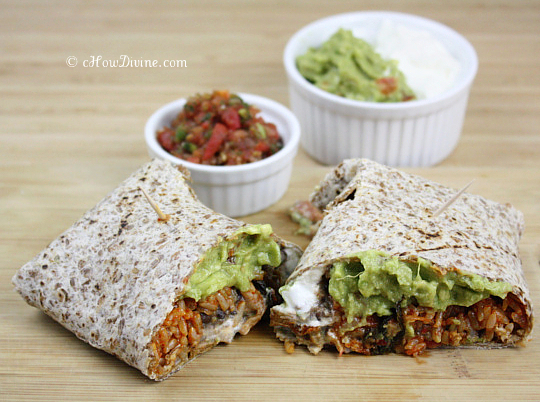 Wow it sounds very very delicious, what a genius idea with the rice in the Black Bean burritos. Such a genious inspiration. Have a wondeful Day! Thank you so much for your kind words! It’s one of my favorite dishes (come to think of it, I have lots of favorites! :-)). I love kimchi fried rice and I’ve been trying to master my kimchi fried rice at home. This is such a creative way to serve the rice. Thanks for sharing it! You’re welcome Yi! 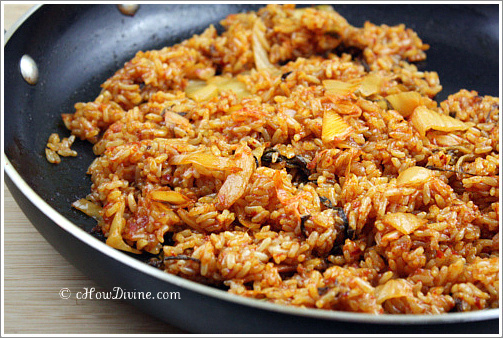 Kimchi fried rice is one of the easiest & yummiest dishes to make; hence, it’s a very popular midnight snack. And it’s great way to get rid of kimchi that’s over it’s prime! Looks so delicious, my mouth is salivating right now! Definitely will use your recipe as a base for a gfree version! If you have celiac disease or want to avoid gluten all together, make sure the gochujang is gfree. Unless it says so on the label, it probably isn’t. They probably contain soy sauce (which contain wheat) or other ingredients that may have gluten in them. Let me know how it turns out! Now that is my kind of burrito! Know what you mean! Love the combo of Korean and Mexican flavors! This looks so good! Burritos are so simple, but so yummy! I could eat them every day! Thanks Erin! 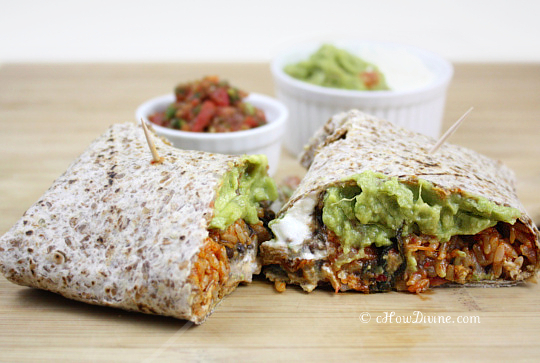 Me too – I can survive on soft tacos and burritos (with a spicy Asian twist, of course)! Yum! Fantastic Recipe! Tried these, and added some corn in the mix. Absolutely delicious. Thank you Lindi! Ooh ~ I’m sure it’s yummy with some corn mixed in! Love this recipe! Thanks so much! I love kimchi bokum bop and this amazing! So glad you like it Greg! Kimchi bokkeumbap is one of my favorite foods of all time. It’s even great for a midnight snack. :) Hope you have a great weekend!! Copyright © 2011-2019 cHow Divine. All Rights Reserved.